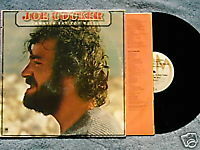 A M SP 4529 Joe Cocker Jamiaca Say You Will 1975 LP includes title track, (That's What I Like) In My Woman, Where Am I Now, I Think It's Going to Rain Today, Forgive Me Now. Recording includes Randy Newman, the Kingpins with Bernard "Pretty" Purdie on drums. Arranged and produced by Jim Price. Vinyl is excellent; cover has ringwear and saw cut; inner sleeve has photo and lyrics.